Copyright © 2011-2017 Red Hat, Inc. and/or its affiliates. It is easy to install Red Hat JBoss Fuse and tailor the installation to a particular environment. Before attempting to install and use Red Hat JBoss Fuse, make sure your system meets the minimum requirements. Red Hat tests and supports Fuse products in the configurations listed at Red Hat JBoss Fuse Supported Configurations. For details of the Java runtimes supported by Red Hat JBoss Fuse, see Red Hat JBoss Fuse Supported Configurations. Do not install the Java runtime under a directory path that includes whitespace. For example, C:\Program Files\Java\jde7 is not an acceptable install path and will lead to unpredictable errors in Red Hat JBoss Fuse at run time. Red Hat JBoss Fuse supports the standards and protocols listed at Red Hat JBoss Fuse Supported Standards. In addition to the disk space required for the base installation, a running system will require space for caching, persistent message stores, and other functions. Red Hat JBoss Fuse 6.3 is delivered in packages. The standard install package is available for download from the Red Hat Customer Portal. It installs Apache Karaf, Apache Camel, Apache ActiveMQ, Apache CXF, SwitchYard, and the Fuse Management Console (Hawtio). It is possible to create your own custom assembly of JBoss Fuse 6.3, containing a customized subset of the JBoss Fuse features and bundles. You can use this approach to replace the Minimal and the Medium install types, which were available for versions of JBoss Fuse prior to 6.2. To create a custom assembly of JBoss Fuse, see Appendix C, Generating a Custom Assembly or an Offline Repository. Red Hat JBoss Fuse is installed by unpacking an archive system on a system. This provides an easy way for a developer to get up and running. You can download the Red Hat JBoss Fuse archive from the Red Hat Customer Portal>Downloads>Red Hat JBoss Middleware>Downloads page, after you register and login to your customer account. Select Fuse, listed under Integration Platforms, in the sidebar menu. Select 6.3 from the Version drop-down list on the Software Downloads page. Click the Download button next to the Red Hat JBoss Fuse 6.3 on Karaf Installer file. Red Hat JBoss Fuse is packaged as a .zip file. Using a suitable archive tool, such as Zip, unpack Red Hat JBoss Fuse into a directory to which you have full access. Do not unpack the archive file into a folder that has spaces in its path name. For example, do not unpack into C:\Documents and Settings\Greco Roman\Desktop\fusesrc. Do not unpack the archive file into a folder that has any of the following special characters in its path name: #, %, ^, ". The JBoss Fuse development environment is included in JBoss Developer Studio starting with Developer Studio 11.0. After you download Developer Studio, see the Red Hat JBoss Developer Studio 11.0 Installation Guide. During installation, in the Select Additional Features to Install page, be sure to select JBoss Fuse Tooling. Switchyard is included in JBoss Developer Studio Integration Stack. To install Switchyard tooling, see the Red Hat JBoss Developer Studio Integration Stack Installation Guide. The server's remote command console is not configured with a default user. Before you can connect to the server's console remotely, you must add a user to the configuration. Red Hat JBoss Fuse is not installed with a default user for the remote console. Before you can remotely manage a server, you must add a user by editing InstallDir/etc/users.properties. The information in this file is unencrypted so it is not suitable for environments that require strict security. Open InstallDir/etc/users.properties in your favorite text editor. Locate the line #admin=admin,admin,manager,viewer,Operator, Maintainer, Deployer, Auditor, Administrator, SuperUser. This line specifies a user admin with the password admin and comma-separated list of roles. Uncomment the line by removing the leading #. Change the first admin to the desired user name. Change the second admin to the desired password. Leave the role list, admin,manager,viewer,Operator, Maintainer, Deployer, Auditor, Administrator, SuperUser, as is. You can run the JBoss Fuse container in offline mode (that is, without an Internet connection). But if you are planning to deploy custom applications to the container, it might be necessary to download additional dependencies (to a local Maven repository) before you can run the container in offline mode with these applications. Runtime dependencies—the dependencies required to run the JBoss Fuse container, in its default configuration. Build-time dependencies—the dependencies required to build a custom application (which might include third-party libraries). Running the JBoss Fuse container in its default configuration—is supported in offline mode. The default configuration of the JBoss Fuse container is specified by the featuresBoot property in the etc/org.apache.karaf.features.cfg file. The requisite dependencies are all provided in the system/ sub-directory of the installation. Installing additional features—is, in general, not supported in offline mode. In principle, you can use the features:install command to install any of the features from the standard feature repositories (as specified by the featuresRepositories property in the etc/org.apache.karaf.features.cfg file), but the majority of these features must be downloaded from the Internet and are thus not supported in offline mode. Deploying custom applications—is, in general, not supported in offline mode. There may be some cases where an application with a minimal set of build-time dependencies is deployable offline, but in general, custom applications would have third-party dependencies that require an Internet connection (so that JAR files can be downloaded by Apache Maven). If you do need to deploy an application with dependencies that are not available offline, you can use the Maven dependency plug-in to download the application's dependencies into a Maven offline repository. This customized Maven offline repository can then be distributed internally to any machines that do not have an Internet connection. For more details of this approach, see section "Offline Repository for a Maven Project" in "Fabric Guide". SwitchYard is a lightweight service delivery framework providing full lifecycle support for developing, deploying, and managing service-oriented applications. It works with Apache Camel to provide a flexible integration runtime with comprehensive connectivity and transports. 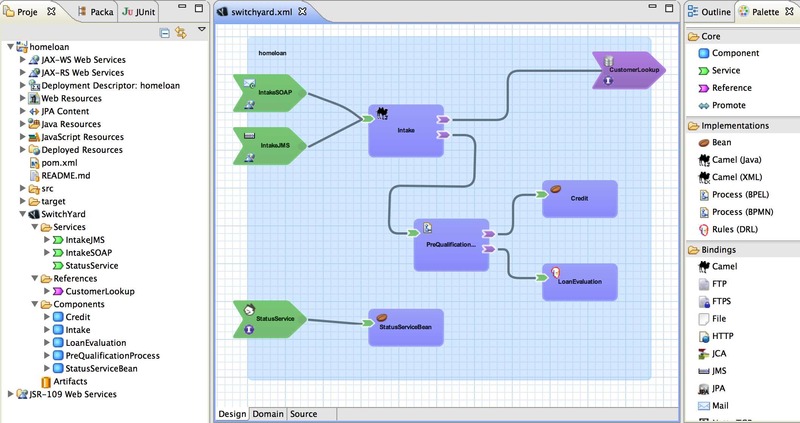 SwitchYard tooling is provided with Red Hat JBoss Developer Studio Integration Stack. To install Switchyard tooling, see the Red Hat JBoss Developer Studio Integration Stack installation guide available from the customer portal. When a SwitchYard application is installed, its dependencies will be installed automatically as long as its features file is defined correctly. You can test this by installing a quickstart application on a fresh installation of the JBoss Fuse Apache Karaf container. You can also install SwitchYard and its related components manually. Each SwitchYard component and application is provided as a feature. Packaged features (including quickstart applications) are defined in the SwitchYard features file located at installDir/system/org/switchyard/karaf/switchyard/2.1.0.redhat-630187/switchyard-2.1.0.redhat-630187-core-features.xml. List the available SwitchYard features by entering the following console command. If this is a fresh instance, they will all be uninstalled at this point. List the SwitchYard features again. You will now see that SwitchYard (the switchyard feature) has been installed, along with its dependencies as defined by the SwitchYard features file. You can find a variety of SwitchYard applications in installDir/quickstarts/switchyard. You can find out more about running each quickstart application by reading the accompanying Readme.md file for each. There is no need to add the features URL as described by the Readme.md file. SwitchYard features are already defined in installDir/system/org/switchyard/karaf/switchyard/2.1.0.redhat-630187/switchyard-2.1.0.redhat-630187-core-features.xml. The following procedure demonstrates how to install and run the camel-quartz-binding quickstart application. This application makes use of the camel-quartz component which schedules a logging service to run every second. List the SwitchYard features again. You will now see that the camel-quartz-binding application (the switchyard-quickstart-camel-quartz-binding feature) has been installed, along with its dependencies as defined by the SwitchYard features file. Find out more about this quickstart application in installDir/quickstarts/switchyard/camel-quartz-binding/Readme.md. Find out more about SwitchYard. Red Hat JBoss Fuse includes standard distributions of Apache Camel and Apache CXF in the installation's extras directory. If you want to use a standard distribution of Apache Camel or Apache CXF, without the OSGi container or Fuse Fabric, use the archived versions in the installation's extras directory. You can copy these files to the desired location and decompress them using the appropriate utility for your platform. Do not unpack an archive file into a folder that has spaces in its path name. For example, do not unpack into C:\Documents and Settings\Greco Roman\Desktop\fusesrc. Red Hat JBoss Fuse strongly supports Maven, an open source build system available from Apache Maven. To use Maven to build your projects, you need to specify, in a Maven settings.xml file, where required artifacts are located. For details on setting up Maven to work with Red Hat JBoss Fuse, see chapter "Building with Maven" in "Deploying into Apache Karaf". The Karaf container in JBoss Fuse comes with a large collection of features installed by default. While this offers the advantage of a highly functional container, it requires a large amount of memory and resources. For some deployment scenarios, it can be an advantage to strip down the Karaf container to use the minimal set of features required for your application. A custom assembly is the most effective way to create a stripped down Karaf container that deploys only the features needed for your application. The same procedure that is used to generate a custom assembly also generates an offline repository. A custom assembly is a custom distribution of the Karaf container based on JBoss Fuse, which is generated using a specific toolchain of Maven plug-ins. The quickstart examples include a template, quickstart/custom, which demonstrates how this toolchain works and provides you with the starting point for creating your own custom assemblies. A custom assembly is generated using essentially the same toolchain as the official JBoss Fuse Karaf container distribution. If your starting point is a JBoss Fuse rollup patch (which is, in fact, equivalent to a complete distribution of the JBoss Fuse product with patches already applied), and you then follow the steps for generating a custom assembly, what you end up with is a patched custom assembly. No actual patching step needs to be performed in this case, however, because the patch is already built-in to the custom assembly. An offline repository is a Maven repository that contains a custom collection of Maven artifacts that would otherwise need to be downloaded from the Internet. For JBoss Fuse deployments that lack Internet access, the offline repository makes it possible to run the container in an isolated network by providing all of the Maven artifacts that your application might need. For details about how to install an offline repository in a standalone Karaf container, see chapter "Locating Artifacts with Maven and HTTP" in "Deploying into Apache Karaf". The quickstart/custom example provides a template for generating your own custom assembly. The default configuration of the custom example includes a very minimal collection of Karaf features. You can easily customize this configuration to specify example which Karaf features you would like to include in the custom assembly. To generate a patched custom assembly—download the latest rollup patch from the Red Hat Customer Portal. Go to the InstallDir/quickstarts/custom project. Customize the features that will be included in the custom assembly's system/ directory (or in the generated offline repository) by editing the project's pom.xml file. The patch feature and the fabric feature are both required, and must be added to the configuration. (Not required for an offline repository) Customize the list of features that will be installed automatically when the custom assembly's container first starts. The patch feature and the fabric feature are both required, and must be added to this list. If the purpose of this build is to create an offline repository, the procedure is now finished and you can skip the remaining steps. To reduce the size of the custom assembly, delete the extras/ subdirectory from custom-distro-ProductVersion-bin (saving about 67 MB). For example, if the ProductVersion is 6.3.0.redhat-187, the new directory name must be jboss-fuse-karaf-6.3.0.redhat-187-baseline. The preceding file is the baseline archive for the custom assembly. The custom assembly, Working/custom-distro-ProductVersion-bin, is now complete. If you like, you can compress this directory into a Zip archive and distribute it as is. When you are finished testing the custom assembly container, shut it down by entering the shutdown console command, and tidy up the custom assembly installation by removing the data/ subdirectory (which holds the data from the current container instance). io.fabric8.patch.management.PatchException: Can't find baseline distribution in patches dir or inside system repository. Apache, ServiceMix, Camel, CXF, and ActiveMQ are trademarks of Apache Software Foundation. Any other names contained herein may be trademarks of their respective owners.